LAKEVILLE, IN. – Just 10.6 miles separate Bremen High School and LaVille Jr-Sr High School. The distance, coupled with the fact that this girl’s high school basketball rivalry goes back to the days of the Northern State Conference, these two schools could face each other three times in a season. 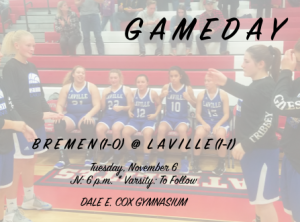 Bremen and LaVille meet during the regular season, have the chance to face one another in the TCU Bi-County Basketball Tournament, and, when the ping-pong balls land just right, in the Indiana High School Athletic Association state tournament. Tuesday, November 6, the two neighbors meet for the 36th time since 2000-01. The series has been almost evenly split over the last 10 meetings. Bremen holds a narrow 6-4 advantage. Trynitie Cox leads the Lancers, averaging 10.5 ppg and 15 rpg. Julia Hall is next with 8.5 ppg and 5 rpg. “Bremen returns a very veteran squad with size and good guard play,” said LaVille coach Corey Duncan of the Lions. “Their starting five is solid. Shively, Rodriguez, Feldman, Duran, and Coffel all have the ability to score. “Our goals will be to lessen the turnovers and let our defense create offensive opportunity,” concluded Duncan. The JV game will tip at 6 p.m., with the varsity to follow. COACHES: Alex Robinson (29-21 in third year at Bremen). Corey Duncan (35-37 in fourth year at LaVille). SERIES SINCE 2000-01: Bremen leads, 24-11. LAST MEETING: LaVille def. Bremen, 52-37, Jan. 18, 2018. THIS N’ THAT: Bremen is 12-13 in games played on the road under Coach Robinson . . . LaVille is 19-16 in games played on home under Coach Duncan . . . Trynitie Cox scored 16 points and grabbed 10 rebounds in a 66-25 loss at South Central (Union Mills) Saturday . . . Bremen is coming off a 12-12 season a year ago . . . Karlee Feldman led Bremen in scoring with a 16.7 points per game average in 2017-18, Erin Coffel 12.4 ppg, and Kaelyn Shively 7.3 ppg . . . Coffel scored 18 points, Shively 13 points, Feldman and Hailey Rodriguez 11 points in a 62-48 victory over Tippecanoe Valley Nov. 1, 2018 . . . Bremen was 10-4 in 2017-18 when scoring at least 42 points . . . LaVille was 11-1 in 2017-18 when scoring at least 46 points . . . Alex Robinson is 4-1 v. LaVille . . . LaVille coach Corey Duncan is 1-4 v. Bremen.